The indie title's four developers discovered freedom within its restrictions, and made a game "without stressing the hell out"
The challenges of independent development are real and numerous, but in the right circumstances those challenges can provide the perfect environment for creativity to blossom. That was the case for Minit, a game that provides as intriguing a set of limitations for its players as it did for its four-person development team. Minit was created by Jan Willem Nijman, Kitty Calis, Jukio Kallio and Dominik Johann, a small team with a diverse background of game development credits. Nijman co-founded Vlambeer with Rami Ismail and has worked on multiple retro-styled games, some of which had music written by Kallio. Johann, co-founder of Crows Crows Crows, has been primarily involved with what Nijman referred to as "weird VR experiments." "It's important to understand your design limitations. Be familiar with the size and scale of the game"
Finally, there's Calis, who had the most dramatic transition of all coming from work on Guerrilla Games' Horizon Zero Dawn. "Minit is a small team, which makes it easier to switch or experiment," she said. "While on Horizon it's all different teams and workflows. Think multiple departments and pretty big teams to help style and mock up, not to mention program and design areas that are carefully thought through. It's important to understand your design limitations. Be familiar with the size and scale of the game." Nijman noted that the idea of self-imposed limitations had been there from the beginning, as a way to ensure what the project on was both simple to execute and fun to work on. In Minit, that "limitation" comes in the form of a single mechanic: a timer. The player has 60 seconds to do anything in the world. After that, they are sent back to their 'home' within the world, though certain collected items and abilities will persist. By accumulating these new items and abilities, the player can access areas they were previously unable to, gradually accomplishing more and more within the time limit. "We actually went through a few different ideas for how the music would work in Minit," Kallio said. "The system we went with was that I composed a longer track for every area, that I then divided into one-minute parts. When you play the game, it starts with the first part and when you start the next round it playes the second part, and so on. That way it feels like you're still in the same area but there's progress happening. "Putting restrictions there allowed us to focus on what makes it interesting, the things that are different from other games"
"We ran into some problems with syncing the exact one-minute long parts in the game engine, sometimes with music ending before the game time ended. So I composed the one minute parts in a way that I could loop a part of it at the end, and continue it a bit longer than a minute, just in case. The game would then cut the music when the game time actually ended. "All of this was quite a lot of technical planning and setting up on my end, but it paid off in the end, as I basically had the four to five minute full songs ready for the soundtrack." Calis and Johann, too, were forced to adapt their styles. 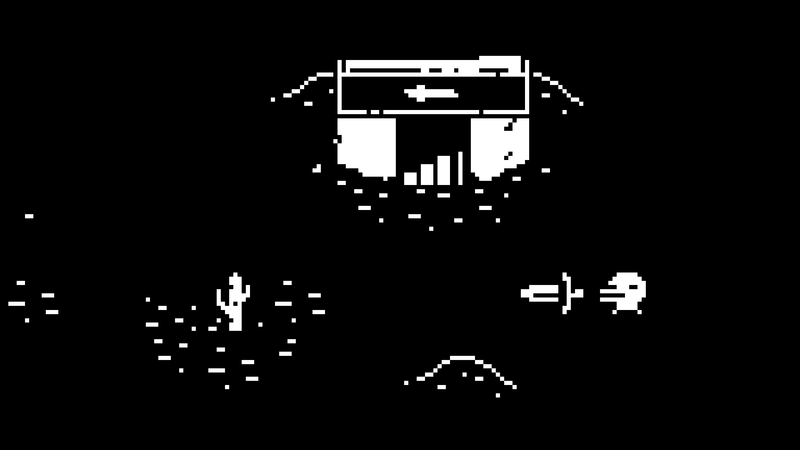 One of the first things anyone notices about Minit is its unique visual style: it's in 1-bit. While that may erroneously read to some as simplistic, this limitation came with its own special set of challenges. 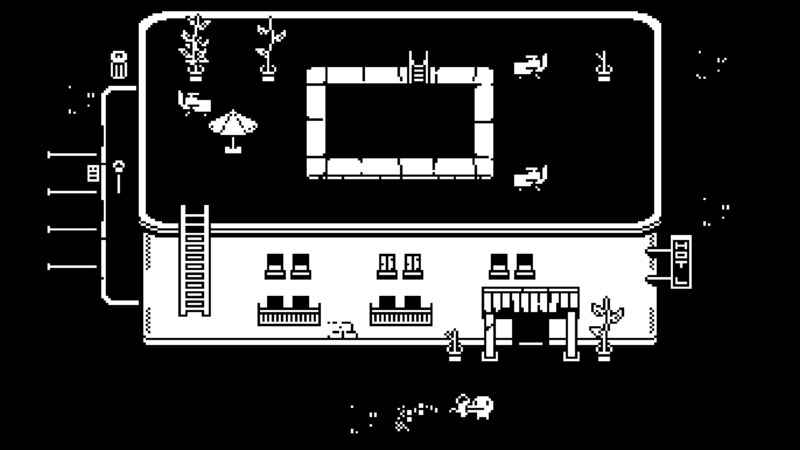 "There's this really big contrast you get [in games like Minit] with everything either black or white," Nijman said. "[Kitty and Dominik] needed to put a lot of care into making sure everything is really readable. You need to know if something is a sword or fence or something, and with colors that's easier. So everything is really precise, but at the same time we wanted to make a game that has loads of little details, loads of unique things. So you're trying to do as much as possible without it becoming unreadable and it creates this kind of tension. "If it was a 3D game we couldn't have said 'This screen is going to be different,' or 'Every puzzle is going to be unique.' Because you're constantly playing one minute loops, we don't want people to have to do the same thing over again. We're not recycling puzzles, we're not recycling content. There's not going to be 20 puzzles about pushing boxes. There's a bunch of puzzles with boxes, but they're all completely different. Coming from bigger projects, it was a really fun challenge, and we were all up for it." What Nijman liked both from the visual and gameplay design was the tension of trying to do a lot with a little. For such a small game with a timer that forced players to move quickly through areas, nothing could exist that didn't serve a purpose, nothing could be repetitive, and everything needed to be immediately recognizable. "Minit is never about optimizing your minute and getting as many points as possible"
"Putting those restrictions there allowed us to focus on what makes it interesting, which is the things that are different from other games. I think if Minit had looked more like a generic, 2D, colorful pixel art game, it wouldn't have been as interesting to me personally, at least." Though the time limit was at the center of the design, Nijman confessed he doesn't usually like timer mechanics. As the team designed around their self-imposed limitation, they also had to find ways make that limitation enjoyable for the player. "We sat down and identified that what was stressing us out about [games with time limits] was the idea of getting punished for making a little mistake early on, or having to do the 'perfect' minute," Nijman said. "Minit is never about optimizing your minute and getting as many points as possible or something. There's more than enough time to do what you want to do and explore and learn, and then you go and take the next minute and you execute. There's a cycle of explore, experiment, execute. "Also, a minute is just short enough to for most people not really be a big deal. If you lose a minute, it's okay, you just try again. That's what the game's about. There's always tomorrow. You don't have to be stressed every day. You can just not work for a bit. That's fine." That laidback sentiment isn't just a gameplay design choice: it carried over into the game's story, as well. As goofy as it may sound, Minit has a surprisingly timely story at its heart that can be viewed as a modern retelling of the fantasy adventures seen in older top-down adventure games. Nijman said that the team didn't want to do a standard fantasy story about beating the "evil wizard," but wanted modern elements such as the coffee and camera items alongside the cursed sword responsible for the main character's time limit trouble. Where did the sword come from? The sword factory, of course. "We proved to ourselves that we could make cool games without stressing the hell out"
"The situation grew from there: everything got automated, all the characters got fired, there's a lot of crime going on, there's bandits hanging around the shady hotel area. Plot-wise, it started to make sense for us more and more to head in that direction, and in a way it's also a game about the stress of daily work, daily routine. You have to do the same thing over and over again. There's never a break. You're always into the next thing. 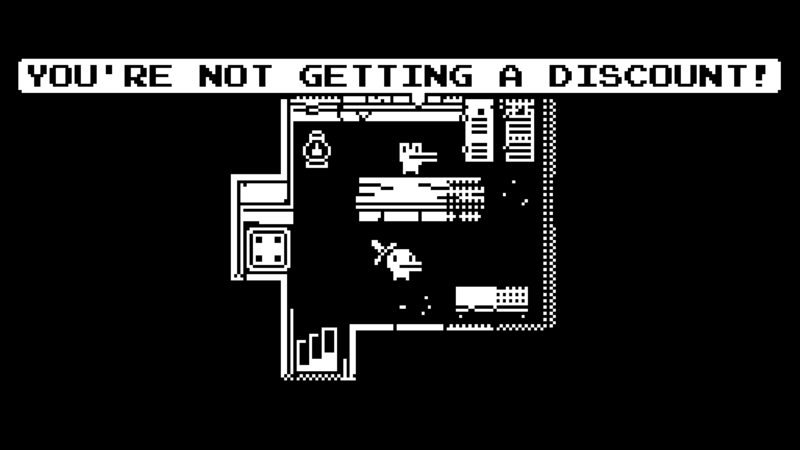 "But the ending of Minit...you just go sit down in your house, go to sleep, hang out with your dog, and just decide, 'I'm done with this.' And you flush your sword down the toilet. It's like, good riddance. It's definitely silly, but it's something we can all relate to." That may sound candid coming from someone working in an industry notorious for crunch, but Minit was created with the same philosophy the team put into the game. "The biggest, coolest thing about working on this, other than just having a great team to work with, is that we had a really healthy work ethic," Nijman said. "We didn't really crunch. We really took our time with everything. We're like, 'We're just going to make this really small game and feel really nice about that.' And it actually worked out really well. A lot of our previous projects have been really stressful, really amazing projects, but still I've burnt out a few times. "For Minit, we proved to ourselves that we could make cool games without stressing the hell out... Even though we all come from cool indie projects and love the things we did, we managed to make a game in a healthy way. That's quite rare in this industry."